Friday night is Shabbos and that means special time with Bubbe. Bubbe makes the best chicken soup in the world, and she says, “Always eat when you’re hungry. Remember that.” When Bubbe can no longer cook and take care of her apartment, she moves into a nursing home. Even though her life is changing, some things, like the love between Bubbe and her granddaughter, will never, ever change. Remember That won the 1992 Highlights for Children fiction writing award. 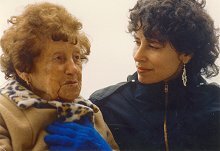 My grandmother, Ruth Levin, and me. In this photo, I am 33 years old, and she is 99. When my grandmother, Ruth Levin, was 99 years old, she moved into a nursing home. She had lived in her apartment in Brooklyn, NY for almost 50 years, so this change was hard for both of us to get used to. 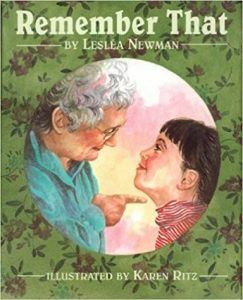 But even though some things were changing, one thing never changed: the fact that she was my grandmother and I was her granddaughter and we loved each other very much. I wrote Remember That to honor my grandmother, and so I would remember all the important things she told me. Friday is my favorite night of the week because Friday night is Shabbos and Shabbos is my special time with Bubbe. Before it gets dark, I run across the street to Bubbe’s apartment. Then Bubbe kisses my face and leaves red lipstick on my cheek that I wipe off with the back of my hand. Bubbe’s house is sparkling clean. I help her set the table. Before I put silverware out, I rub each piece with a cloth so it shines. Then she lights the two white candles in her shiny candlesticks. We both make three circles with our hands to gather in the Shabbos light, and we say the special Shabbos prayer together before we sit down to eat. “Always eat when you’re hungry. Remember that,” Bubbe says. I laugh. “Bubbe, it would be silly to eat if I wasn’t hungry,” I say. Bubbe puts a bowl of soup down in front of me and says, “Ess a bissl.” That means eat a little, but I eat a lot because Bubbe makes the best chicken soup in the whole wide world….